The Recipe Girl: Get Out Those Muddlers... It's Mojito Time! Get Out Those Muddlers... It's Mojito Time! Have you muddled lately? Do you own one of these nifty bar tools? Mine is used almost exclusively for making my favorite cocktail...Mojitos! Since my Vegas trip, I've been dreaming about those Orange- Basil Mojitos that I sipped poolside. So I decided to re-create this drink in the comfort of my own home. If you're already familiar with mojitos, you know that they usually incorporate mint and lime juice. For the Orange- Basil Mojitos, I simply subbed basil for mint and fresh orange juice for lime. It worked! The basil flavor worked well with the orange. I know what your thinking... sounds weird, right? It wasn't weird at all. The basil worked well with the orange and it wasn't overpowering at all. Use that muddling tool to smush the heck out of the basil with the orange juice & sugar. (Don't have a muddler? Not to worry... just use a wooden spoon.) Then you simply add a bit of rum and club soda to finish it off. Top with an orange slice and you're ready for a toast! We loved this... it tasted just like the Vegas drink. Here's your basic Mojitos recipe - for the newbies that want to check out this whole mojito thing. And if you'd like an idea for a perfect summer drink. 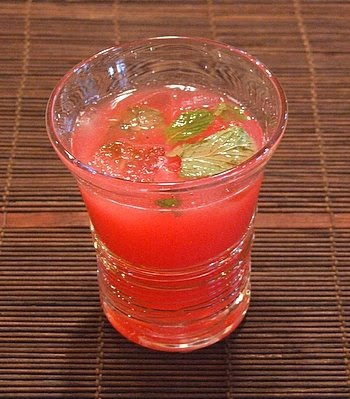 This is it: The Watermelon Mojito. We served these at a barbecue once and the guests didn't leave our house into well into the night. I think one of the neighbors ended up sleeping on the couch. But we won't mention any names. This pretty drink is a Cranberry Mojito. Not just for fall, it actually turns out more pinkish than red so serve it up any old time. 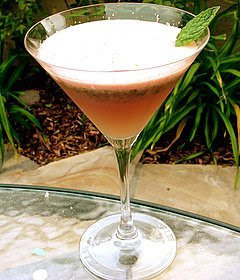 I served this at a Happy Hour party that I had with my girlfriends and it was a huge hit. These Pomegranate Mojitos are made with POM juice (found near the fresh juices at your market.) Also a great choice. 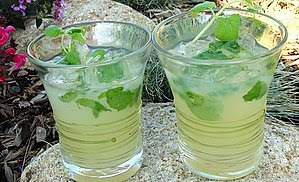 All Mojito recipes can be found by just clicking on any of the recipe titles above.